Accountants and analysts use various turnover ratios to assess the health of a company as compared to its own performance over time, and its performance against its competitors and within its industry. Turnover ratios involve using a full-year income statement amount, such as net sales, and dividing by the average balance of a particular asset type on the balance sheet. The total asset turnover ratio uses the figures of net sales and average total assets to measure the ability of a company to use its assets efficiently to generate sales. Simply speaking, a company with a higher total asset turnover ratio is considered better at making money through the intelligent and efficient use of its assets. The total asset turnover ratio considers total assets, including both current and fixed. Current assets include cash, inventory, and accounts receivable, while fixed assets include property and equipment. To calculate a company's total asset turnover ratio, locate the company's annual net sales from its income statement, and average total assets from its balance sheet. You'll need a balance sheet from two different periods, such as two consecutive months, to calculate the average assets amount, and make sure you keep the time period consistent with that of your sales figure. The result of this equation tells you the number of times the company turned over its assets during the 12-month period. The lower the total asset turnover ratio result, the fewer times assets have turned over as compared to the same ratios using historical data for the firm, the industry, or the company's peers, and likely the more sluggish the firm's sales. A higher ratio result implies that the business has been experiencing potentially higher sales and generating more sales revenue per dollar of assets. Ratios become useful only when compared against the same ratio from another time period for the same company, another similar company in the same business sector, or an average ratio for a group of companies in the same industry. When comparing the total asset turnover ratios from two different companies, take care to ensure the companies really are similar in terms of cost structure, goods or services produced and provided, revenue size, geographic location, and other factors. For example, comparing the ratio for a retail clothing company to one in the automobile industry tells very little because the costs, types, and amounts of assets used by each company vary so much from each other. A low ratio result may indicate that the company has experienced internal or external events that triggered a drop in sales. The firm could also be stuck with old inventory that doesn't sell, or not selling through inventory fast enough. The firm may have a large accounts receivable balance, with few customers paying up front and too many customers paying their credit accounts late. Fixed assets, such as property or equipment, might also be sitting unused and depreciating, instead of generating more goods for sale. If a company's total asset turnover ratio doesn't stand up to that of other companies in the same sector, management might consider postponing new asset purchases such as additional equipment or expanded facilities. 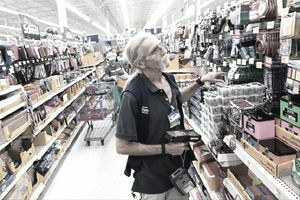 It may also limit purchases of inventory to only immediately-needed stock, consider consolidating or closing underutilized facilities or stores, or make more efficient use of its sales force. If a firm's total asset turnover is excellent as compared to its historical data and to industry data, it could mean the company has improved over its past performance, and does better than its peers, at utilizing all of its assets to generate an ever-increasing level of sales.